Rural Heritage Tourism at its best!! Among the Carolina pines along US 301 just off Interstate 95 in Kenly stands the Tobacco Farm Life Museum, which is a testament to the almighty leaf’s significance to Johnston County and North Carolina as a whole. Without money that flue-cured tobacco brought to countless North Carolina farm families, generations of Tarheel farm children would not have attended college, and many farmers would have lost their land. Organized in 1983, a number of area farmers began a series of guided tours of their tobacco farms for visitors interested in learning more about the bright leaf. Local farm families began donating farming tools and equipment to the museum, some items had been used for decades to plant tobacco in the rich Carolina soil.Visitors were thoroughly fascinated, and the tours grew in popularity. The 6,000 square foot museum has an abundant inventory of farming artifacts, textiles, children’s games, kitchen equipment, medical implements and other tobacco memorabilia. Exhibits range from early harvesting techniques and tobacco auctioning to soil conservation and many examples of authentic tobacco advertising from the 1930s. To better portray the importance of tobacco to visitors, the museum set out in 1989 to assemble an exhibit of an entire farmstead on the site of the museum. An authentic log tobacco barn, farm house, kitchen, and smokehouse were restored to their original beauty, and relocated to the shady pine grove at the museum site. In one of the farmstead’s quaint bedrooms, you’ll find authentic period rugs and bedspreads actually make from used tobacco twine. Over the years, the museum’s exhibits have grown to include a vast collection of farm tools and equipment, schoolhouse mementos, decades-old musical instruments, household goods, as well as Depression-Era medical and dental tools. A most intriguing exhibit is a collection of artifacts from the Tuscarora Indians. They are believed to be Johnston County’s earliest settlers, and raised tobacco in the area as well. The collection includes priceless clay trading pipes used for bartering by early settlers. 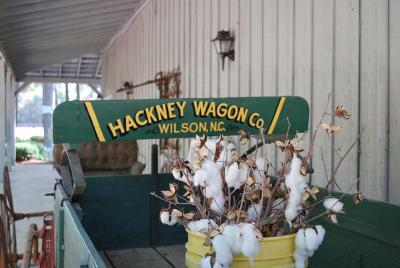 From the clothes he wore to the tools he used, visitors are given a unique perspective into the life of a North Carolina tobacco farmer. Well over 10,000 visitors a year get a chance to experience farm life of days-gone-by at the museum, an experience worth saving. The museum hosts rural art exhibits, and thousands of school children will discover the newest addition of the Barnes Crossroads one-room school moved to the site from the grounds of the community college. For more countryside experiences why not take the day driving tour, Country Crossroads Trail.